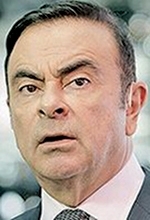 "Fortunately to- day, we are way above 100 yen, so we can compete," Ghosn said last week during a question and answer luncheon with the Japan Chamber of Industry and Commerce. "Our production in Japan is increasing and will be increasing steadily for the next two years," he said. "Now it makes sense because the yen has become much more reasonable." The dollar buys around 124 yen today, up more than 20 percent from a year ago. The yen's slide against the greenback makes Japanese cars more competitive overseas. Japanese automakers have more wiggle room to play with pricing or they can keep prices stable and pack more content into the vehicles to make them more attractive. Ghosn applauded the monetary policies of the Bank of Japan and the government of Prime Minister Shinzo Abe for helping undercut the yen's value after the Japanese currency soared to record highs with the dollar submerged below the 100-yen mark for four years. "They acted on the currency," Ghosn said. "What we needed was only a small push from the government through eliminating the obstacle of the yen. ... And it happened." Ghosn's comments provide fodder to critics in the U.S., including lawmakers and executives at Ford Motor Co., who accuse the Japanese government of currency manipulation. Tokyo denies intentionally massaging exchange rates. Government economists argue that the weakening yen is a side effect of government policies that are actually aimed at jump-starting Japan's moribund economy with extra-loose monetary stimulus. But Ghosn said such efforts would undoubtedly help exporters such as Nissan. "What we're seeing today is a much more competitive yen, allowing a lot of major companies to envision exports that before were practically impossible," he said. Nissan won't be supplanting overseas production with output from Japan. But the yen makes it easier for Nissan to use excess capacity at home to supplement overseas sales, he said. Nissan said this month it will begin building up to 100,000 Rogue crossovers a year for the U.S. at its plant in Kyushu, Japan, starting next year. The Kyushu expansion is on top of the Rogues streaming out of Nissan's Smyrna, Tenn., factory at a rate of more than 150,000 a year. In addition, as many as 80,000 more are scheduled to come from a Renault factory in South Korea.